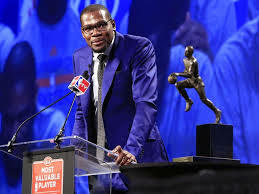 This week Kevin Durant was honored as the league MVP and gave one o fthe greatest MVP speeches in NBA history. During this speech, Durant was spilling tears of joy and tears of the memories and struggles he had to get to where he is now. In my opinion it was the most well done speech in all of basketball and it is up there with the greatest speeches in sports history. Durant talked about his team mates and also shared stories about them. The most notable thing he said was to a team mate was to frustrated star point guard, Russell Westbrook. Durant said, “ A lot of people put unfair criticism on you as a player, and I’m the first to have your back through it all, just stay the person you are, everybody loves you here, I love you.” This is important for Westbrook and his team chemistry because during a time out in a Clippers game Westbrook separated him self from the team huddle and stayed secluded from the team. Durant acknowledged everyone else on his team, which will most likely bond this Thunder team together and make them a force to reckon with. Durant made sure he thanked everyone for their contributions and help in achieving this award. After acknowledging his team mates, one by one, he saved the best for last when he thanked his mother. He thanked her for always being there for him and his brother. He also commented on how the odds were stacked against them, a young single mother with two small children. He finished his speech by telling his mother, “ You’re the real MVP.” This was such a heart warming moment there wasn’t even a dry eye in the building. Durant gave his mother the best Mother’s Day gift ever with those words. I think that his heartfelt speech will glue OKC together. This should help rally the team and the city to win the next four games in this series and beat the Los Angeles Clippers 5-1 and eventually win the NBA title. This entry was posted in NBA and tagged Kevin Durant, nba, Oklahoma City Thunder, Russell Westbrook by just1mike. Bookmark the permalink.